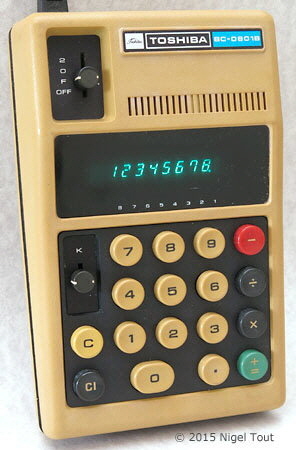 Distinctive features: The first Toshiba hand-held electronic calculator. Technical details: Display is 8-digits blue VFD (Vacuum Flourescent Display), in a single tube. Main integrated circuit - Toshiba TMS0112 (a Texas Instruments design), here date coded week 13 of 1972. 7.2v (6x AA rechargeable cells). 103 x 165 x 45 mm (4.0 x 6.5 x 1.5"). Made by Tokyo Shibaura Electric Co. Ltd, Tokyo, Japan. 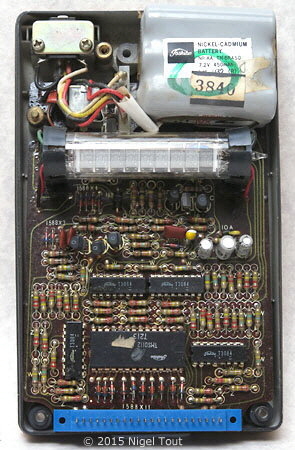 Inside the BC-0801B showing the circuit board and the large number of components required at this time. Top-right is the rechargeable battery, with the VFD display tube below, and then the circuit board. The main integrated circuit is the Toshiba TMS0112 calculator chip (a Texas Instruments design). 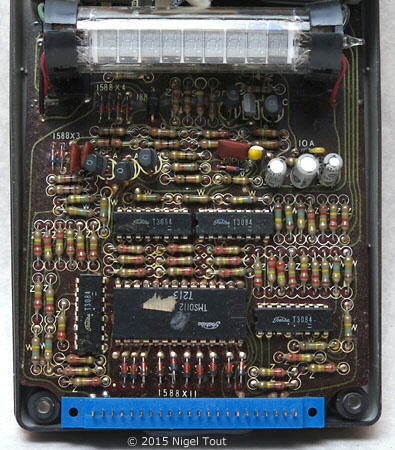 It is surrounded by four smaller integrated circuits, two SN75493 and two SN75494, which interface the low-current capability of the calculator IC to the high-current requirements of the VFD display. The underside of a very high-quality and reliable keyboard. 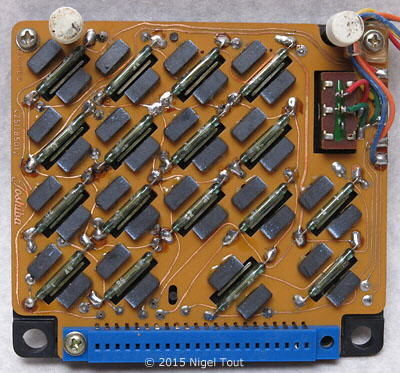 It uses reed-switches between magnets. A steel shaft on the bottom of each key modifies the magnetic field and triggers the switch to close.